My blog consists mainly of make-up loves of mine that I want, need to share with everyone! That being said I present some more HOT summer skin loves I've presently been loving, using and telling everyone that will listen about them! First up the new Maybelline Dream Fresh BB 8-in-1 Beauty Balm Skin Perfector. I managed to snag this at Walmart for about $6. I've been using this for about 3 weeks and while I'm still iffy about it will add that I love the way it applies! It feels like silk gliding onto the skin- I have been applying using my fingers of course and it sits beautifully. I do have to set it with powder (more often than my beloved NARS Sheer Glow) but usually just wear this to work, errands or if I'm going to be swimming, etc. It has an SPF of 30, which is great! The colors available are great, I believe in the US- 6 colors were made available. I picked up Medium/Deep and it matches my skin exactly. My skin is combination (more oily than dry during the summer), I like to apply Peter Thomas Roth Max Sheer All day Moisture Defense Lotion Oil-free SPF 30, if I'm just going to be swimming. 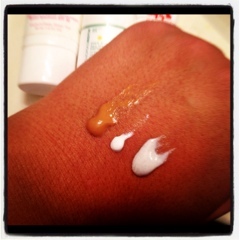 I received this small sample in my Sephora Sun care kit and love it! May have to repurchase when this is done. Sinks into the skin immediately, and leaves no streaks or whiteness on the skin. Long name but very worth it in the Long run! Lastly is Origins Vitazing SPF 15 Energizing boosting moisturizer with Mangosteen. Also received this in my Sephora Sun Care. I'd wanted to try this for several months after reading it in several blogs, and I usually apply a bit of this over my PTR moisturizer or under my Maybelline BB cream. It states on the bottle that there is a Sheer Tint release, when it's squeezed out of the tube it looks a bit off white with a beautiful sheen but no color on my skin (no surprise as I'm often to dark for "sheer" products) but a lovely product nonetheless! It smells delightful! And I can honesty see a sheen sitting atop my skin while wearing this. Although I may not repurchase if I finish this off (pricey product!) I'm glad I got to try it and will definitely continue to use it through the summer. 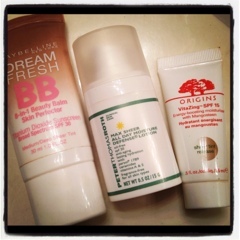 swatches are the same line up as the products pictures: Maybelline BB cream, PTR, Origins Vitazing. I just got this Maybelline one last week but haven't gotten a chance to try it out yet. I hear it feels light and lovely on the skin--though I don't have high hopes on how well it's going to last on me (I have very oily skin). But it's the first drugstore base product I've purchased in years, so I'm kinda excited to see how it goes! I'm interested in hearing your thoughts on it Becca- I want to like it but my skin is too oily at the moment (summer time!). I'm all about drugstore makeup as I'm on a huge budget nowadays! I will splurge on special items, i.e. foundation (! ), and some limited edition items.